“I know, I know,” writes Caltech’s Mike Brown, the Richard and Barbara Rosenberg Professor of Planetary Astronomy, who specializes in the discovery and study of bodies at the edge of the solar system. “We have all been instructed by Arthur C. Clarke to attempt no landings on Europa. But if you did land on Europa, wouldn’t you like to know where to go? “If, on a whim, you climbed down a crack on the surface of Europa and made your way down into the ocean (which, interestingly, might be something you actually could do; though it is more likely you would get stuck and squeezed to death; hard to tell) and then you figured out how to swim down to the rocky bottom something like 100 km below the base of the ice (a depth 10 times greater than the Marianas Trench, by the way) you would instantly be able to answer what to me is one of the most interesting mysteries about Europa. What is happening at the boundary of the rocky core and the ocean? The answer has profound effects on the type of world that Europa ultimately is. A new study performed by scientists at NASA’s Jet Propulsion Laboratory focused on linear features called “bands” and “groove lanes” found on Jupiter’s moons Europa and Ganymede. Scientists have used the same numerical model to solve mysteries about motion in Earth’s crust. The animation is a two-dimensional simulation of a possible cross-section of a band running through Europa’s ice shell. At the extreme bottom is Europa’s ocean, and the thick white line across the top represents the moon’s surface ice. The midsection is the bulk of Europa’s ice shell, with warmer colors (red, orange, yellow) representing stronger, more rigid ice. Depth is marked on the left side of the animation while numbers on the bottom measure distance from the center of the band feature on Europa’s surface. Bands on Europa and Ganymede are typically tens of miles wide and hundreds of miles long. Numbers at the top mark the passage of time in thousands of years. As the animation runs forward, the ice shell is deformed by gravitational interactions with Jupiter. The cold, brittle ice at the surface gets pulled apart. At the same time, faults in the upper ice form, heal, and re-form (visible as diagonal yellow, green and blue lines in the upper center of the animation). 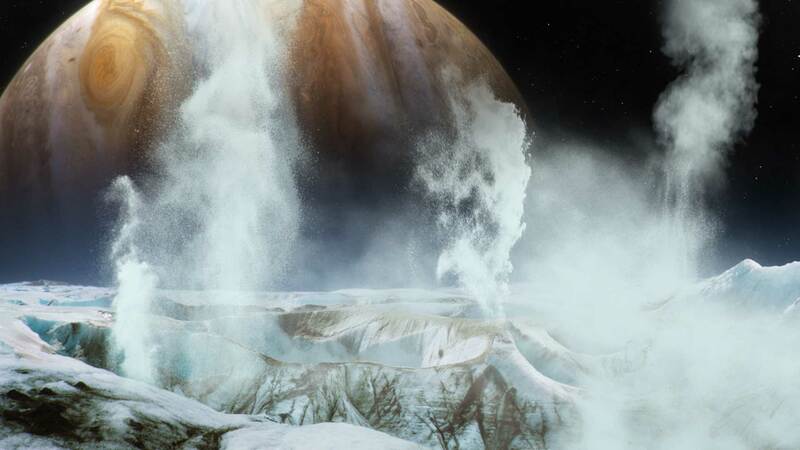 The churning material that quickly fills the bottom half of the view is a collection of tiny white dots representing bits of Europa’s ocean that have been frozen into the bottom of Europa’s ice shell (i.e. where the liquid ocean is in contact with the frozen shell). In the paper, the scientists describe it as “fossil” ocean material because the bits of ocean trapped in Europa’s ice shell spend many hundreds of thousands, if not millions, of years being carried to the surface. In other words, by the time the ocean material reaches Europa’s surface where it can be analyzed by a passing spacecraft, it no longer serves as a sample of Europa’s ocean as it is in the present. Instead, the spacecraft would actually be studying Europa’s ocean as it was a million or more years ago. Hence, it is fossil ocean material. NASA’s Europa Clipper spacecraft is intended to launch in the early 2020s. The spacecraft will then orbit Jupiter and become the first spacecraft to study Europa exclusively, including the composition of the moon’s surface material. The mission will likely be able to test the model simulated above by using ice-penetrating radar to probe the moon’s bands. If Europa indeed behaves the way the simulation suggests, it might carry ocean material to the moon’s surface, where Europa Clipper would analyze it remotely using the spacecraft’s infrared and ultraviolet instruments, among others. Scientists could then study the material’s composition to consider whether Europa’s ocean might be hospitable for some form of life.